Q: How many rings does it take to turn a Númenórean nobleman into a wraith? A: Three rings. One ring to rule him, one ring to find him, and one ring to bring him and in the darkness bind him (orc-laughter is heard in the background). Mordor (in Russian: Мордовия) is a former Soviet nation, which became an autonomous republic in 1984 with the fall of Hadrian's Wall. It borders Slovenia, Land of the Dead, Euthanasia, Ankh-Morpork, Magincia, Cop Land and Iraq. Mordor nowadays tends to go by the name of Luton, a large shithole located in England. Capital of Mordor in fair weather. 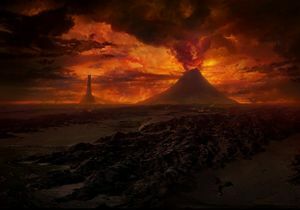 Hoards of Usag'Hi tamed the wilderness of Mordor in advance of Sauron's arrival. For those without comedic tastes, the so-called experts at Wikipedia have an article very remotely related to Mordor. Originally a beautiful area of fertile plains and rocky volcanic mountains, the region that would later come to be known as Mordor was first settled by roving bands of fierce warriors known as Usag'Hi. They were cute as buttons, and each of them accepted Sauron as their liege lord. Much of the south of Middle Earth fell to their fearsome doe eyes and were taken into the Dark Kingdom. Mordor played host to the first ever Football World Cup in 4013BC, in the end winning the title by beating The Shire 12-11 in the final. 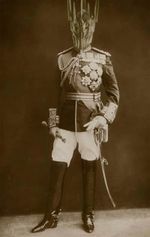 Mordor sent many troops to aid the Bolsheviks in the Russian Revolution, and quickly allied itself with Moscow. By the 1920s, it was a stalwart component of the USSR. Following the deposition of Stalin and the fall of communism, Mordor has sought admission to the European Union, despite being located 4000 miles directly above Europe. Mordor was overrun by tripped-out hippies in 1971, including the mysterious and godlike High Revolutionary, after being mentioned in the Led Zeppelin song, "Ramble On." The current Lord of the Ring of Mordor is Sauron, also the Lord of the Dance, an honorary title. The title of the Lord of the Ring is ceremonial at best, and does not bestow unto Sauron any real powers. If the truth be told, he is a very ordinary citizen of Mordor and just walks about aimlessly talking to himself. He also quickly contradicts his previous statements, when no one is looking. Its minister of foreign relations is known as the Mouth of Sauron who, unbeknownst to most, is actually Kate Winslet hiding under a hideous black mask. Mordor has no culture since it only tends to steal and pervert things created by others, such as Gondorians. However, it does have the annual "Find the Ring" contest for orcs and other corrupted beings, in which the participants will attempt to find a golden ring that, according to legend, Lord Sauron once lost in a bar fight with a Gondorian prince by the name Isildur. The reward for finding and bringing this relic to Sauron is to live for a maximum of two extra years (a vaunted prize considering the ultralow life expentency in Mordor). However, this has never happened until T.A. 3019 when three hobbits attempted to participate in the contest; they did find the ring but committed the faux pas of throwing the ring into the fires of Mount Doom due to mistaking it for a wishing well since they were of foreign origin, which ended with disastrous results. Mordor is believed to be slightly Northwest of Uzbekistan. The exact location is unknown, as those who have ventured into Mordor have never been heard from since. This is believed to be due to the incompetence of the Mordor Postal Service. According to rumour, the ancient city of Euthanasia is located a few hundred miles to the south-southeast of Mordor, hidden beyond an inaccessible mountain range. It is here the aforementioned tripped-out hippies are believed to have withdrawn some years after the sudden strike at Mordor in 1971. 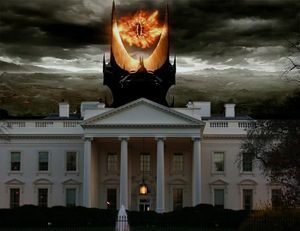 According to the United States (formerly known as the Divided States), however, Mordor is located near the United States of Aenglyand somewhere between Loch Ness and The Independent Soviet Anglophone Socialist Republic of Cornwall, though it's exact location is rumoured to be in a Nuclear Weapons Dump. It was also the setting for George Orwell's psychotastic novel 1984.5. Goldie Lookin Chain are a well known band from Mordor. other: J. R. R. Tolkien • J. R. R. Tolkien: A Biography • Bored of the Rings • FIFA Middle Earth Cup • Google Middle Earth • Mordor Jalapeños • The One Ring • Silmarillion • The Hobbit • UnNews:2010 FIFA Middle Earth Cup soon to begin • UnNews:Forces of Mordor lay siege to Minas Tirith • UnNews:Morgan Freeman to play Bilbo Baggins in "The Hobbit"
This page was last edited on 22 October 2015, at 00:09.